Shacknews plays Dark Souls 3 at the Bandai Namco 2015 Summer Showcase and tries not to die. We didn't get very far, but at least there are helpless worshipers to take our frustrations out on. The newest addition to the Dark Souls saga once again puts players in the role of a mysterious fighter that must wander a dangerous world in ruins. Although the developers are not yet ready to provide too many details on who the main charcter or the plot, there is a sense that fans are in for familiar experience, as they make their way through a series of powerful creatures in a brand new setting. I recently had the chance to check out the game at the Bandai Namco Summer Showcase. So, donning a full set of armor and armed with a shield and sword, I put my might to the test to see how far into the world I could make it. Unsurprisingly, the answer is: not very far. One of the most striking aspects of Dark Souls 3 is its sheer size. My character appeared on top of a small tower, where I could take in the view of the world. The previous game was large, but the third game is out to beat it by providing an entire ruined nation to explore. Players will be able to travel to just about anywhere they can see. It is a world that is dying because its golden sun threatens to fade out. Players must adventure forth, discover what is happening to the world, and find out why a character named The Lord of Cinder has awoken. That means defeating a long string of monsters before reaching the truth. 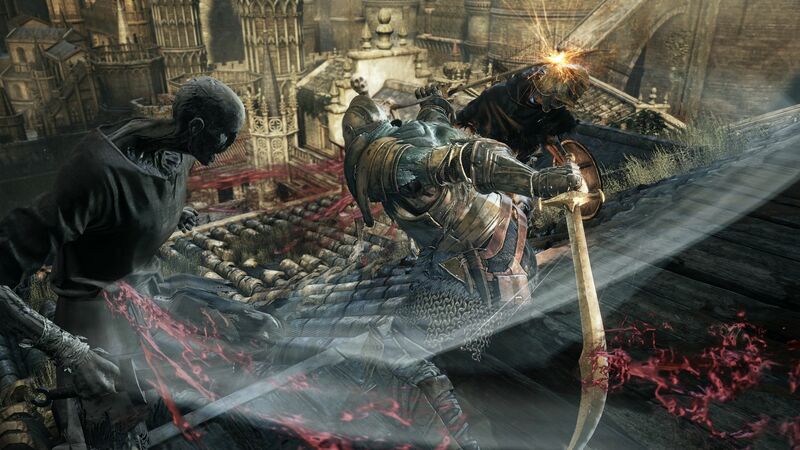 Heroes will have some new moves in Dark Souls 3. While the standard light and heavy attacks are still present, players will have the option to perform Battle Arts moves. These are special alternate moves that change according to what weapon the character is holding. Pressing the left trigger will change the character's stance, readying to unleash some powerful moves. For example, using a light attack with short sword is a shield break, that can be followed-up with another strike, while hitting heavy attack performs a running lunge. Other moves include performing a spinning attack with dual scimitars, and doing a Battle Cry while holding a battleaxe, which will increase its damage for a time. Using a Battle Art move consumes a Battle Art point, but they can be replenished by resting at bonfires. Moves can still be pulled off without points, but they won't do as much damage. In the demo, I was given twenty to play around with, but I found that they're a little easy to forget about. Especially when a number of enemies are trying to overwhelm you with their numbers. I often found myself reacting to attacks, and couldn't spare the time to shift into Battle Art stance to pull off a special move. Perhaps I would rely on them more if I had a lot more time with the game. Things seemed promising as I moved down the steps of the tower. Patrolling a walkway were two necrotic looking and a guard holding an axe. Other figures include zombie-like worshipers kneeling on the sides, who don't attack or put up any defense if they get hit during a fight. They pretty much sit there as decoration and die with one hit if stricken. It's actually quite amusing to swing a giant weapon around against a monster carrying a giant axe and watch all the collateral damage that occurs. Amidst the carnage, I noticed that someone from behind was firing arrows at me. So, I hastily made my way back up the stairs where an archer was hiding on an overhang. I killed him and thought I might throw blades at the remaining creatures from my strategic location. However, the necrotic dogs came to sniff me out. Fortunately, the only way to get to the overhang is through a narrow opening in a wall. So, I just had to wait for the creatures to run up the stairs and I killed them as they tried to get through the chokepoint. Although the axe-carrying soldier got in some good hits, I managed to get past the section. I couldn't figure out how to dodge, so I ended up backing up and moving forward the best I could to avoid being hit, which usually had poor results. I had a shield, but rarely remembered to use it. Those times I did, it didn't seem like it stopped incoming damage. It just stunned the enemy long enough for me to hit back. As I progressed further, a group of four soldiers stood together at the base of the stairs. Instead of drawing them out, I decided to take the first one head on. However, they had an archer among them, and he was causing me a lot of grief. I tried to run past the others to reach the archer, but ended up over-committing myself, and was quickly overwhelmed. Each time I died, I returned to the top of the tower, equipped with the new weapons I picked up (such as a long sword), and a little more knowledge of enemy placements. However, that knowledge didn't benefit me very much. Monsters are generally tough, hard hitting, and move faster than you. Even after deciding to take an alternate path, I couldn't get very far. But each death was also accompanied with an urge to do better. Now that I knew where the monsters were, I could do better to fight them. At the same time, it took me a long while just to make it twenty feet into this harsh world. I can only imagine the kind of grind it would be to traverse the entire nation. We'll get more details about this ruined world, and how many times you have to die to explore it, as the game comes closer to release. Dark Souls 3 is expected to release in 2016 for Xbox One, PS4, and PC. I can't help it: I love souls games. Bring it on!